You love everything about solar energy—the environmental impact, the high-tech vibe, and especially the utility savings—but you can’t quite fall in love with the way they look. 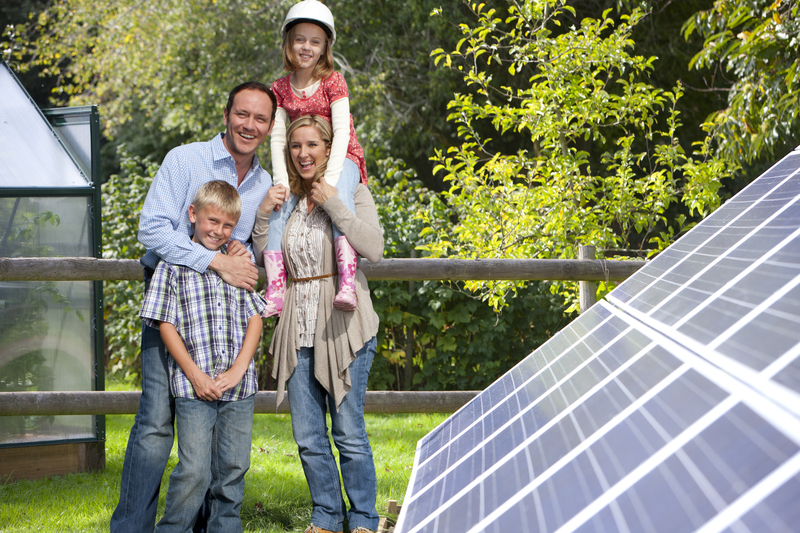 Luckily, you don’t have to choose between a bulky rooftop solar installation or nothing at all. 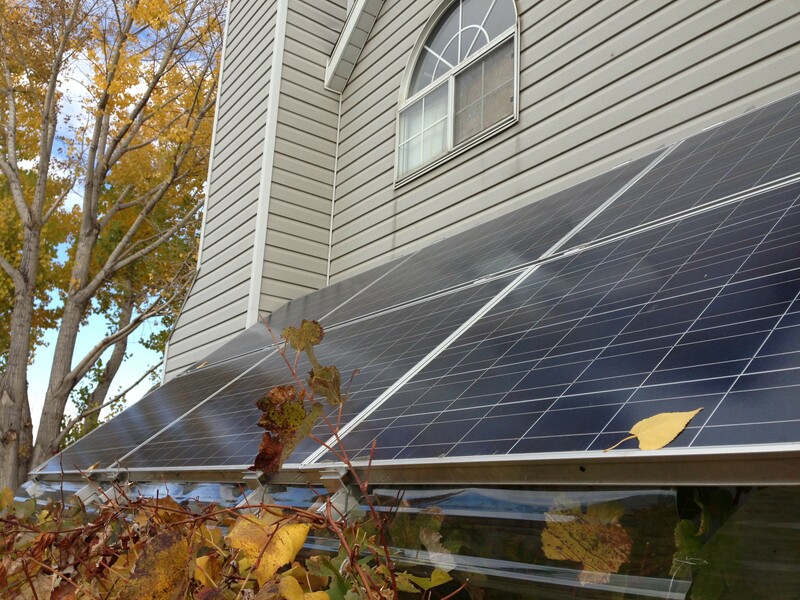 Homeowners these days have all kinds of options to make use of the sun’s energy. And many of the best designs integrate seamlessly into a home’s exterior or add a unique outdoor feature to lawns or gardens beyond. Ready to dive in? Here are some of our favorite ways to get all the power of solar without adding panels to your roof. Not crazy about roof-mounted solar? There’s no law that says you can’t install them on the ground instead (although you may want to check your homeowner’s association bylaws first, since some HOAs are not fond of the way ground mounts look). In fact, if your home’s roof isn’t oriented in the best direction for solar or gets too much shade, ground-mounted arrays can be much more productive than anything you can put on top of your home. Think about it this way: any panels that go on your roof are limited by the roof’s design, which isn’t exactly what works best for solar. For instance, your roof may run east to west instead of north to south—meaning you don’t have a south-facing surface to use when you install—and that means you can’t take advantage of the maximum amount of sunlight. You might face additional challenges if your roof’s angle is too steep or too gentle, since finding the right angle can make all the difference. Ground-mounted panels let you avoid these challenges. In general, you have two choices for ground-mounted systems: standard ground mounts and pole mounts. With a standard ground mount array, the framing is anchored directly into the ground, with the panels held at a fixed angle. In a pole mount system, the panels are suspended on a pole, elevating them from the ground. That elevation makes them ideal for a solar tracking system, where panels adjust their angle automatically to follow the sun’s movements and maximize production. So in many cases, getting low can open up a range of new options to consider. Sheds and garages naturally have a more utilitarian feel than a home, so if your beef with roof mounts is mainly due to the aesthetics, this may be a good way to go. If your shed or garage is located behind your home, you can easily install panels here so they have very little effect on your home’s profile from the road. Unfortunately, you’ll run into some of the same limitations as you would with a roof mount. 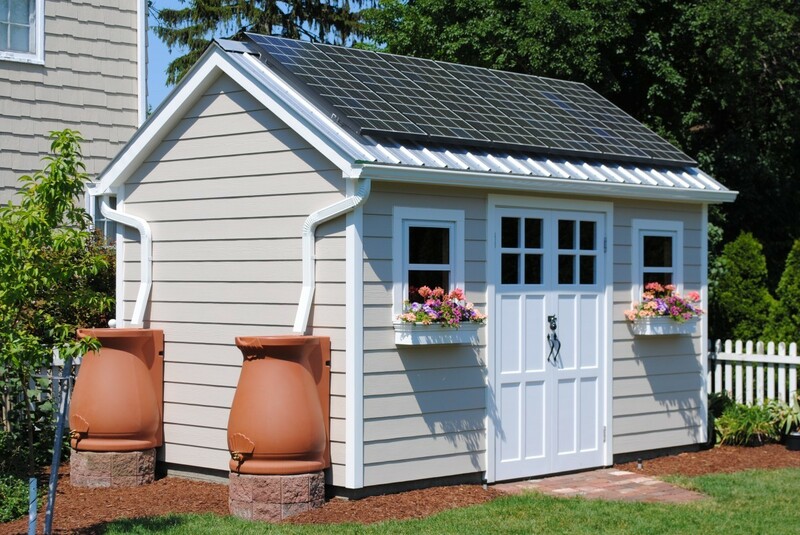 That is, you’ll have to hope that the design of your existing shed or garage has built-in solar potential. But even if you don’t already have the right specs, you can always consider building your own brand-new solar storage shed. On the other hand, some homeowners choose to embrace the look of solar panels by positioning them front-and-center, in place of a patio awning or roof overhang. Solar awnings are a two-in-one win for energy efficiency. They reduce solar heat gain in the summer—by up to 65 percent on south-facing windows and 77 percent on west-facing windows. When you choose to install metal or wooden awnings, you can even add solar panels on top for a full boost of energy-generating power! For a seamless look, ask your solar provider about rackless options. These rail-free solar panels are flush-mounted against overhangs and awnings for a smooth, integrated look. Homeowners add them over patios, outdoor living spaces, or even the front door, celebrating the panels’ sleek, contemporary surfaces by embracing their minimalist appearance. After all, why should you hide your home’s energy potential? A pergola, carport, solarium, or gazebo constructed to hold solar panels makes for another elegant choice. And when you build the feature to suit your solar production, you can optimize performance by choosing the ideal orientation, direction, and slope. These surfaces naturally receive tons of sunlight, so they’re great candidates for a solar panel project. 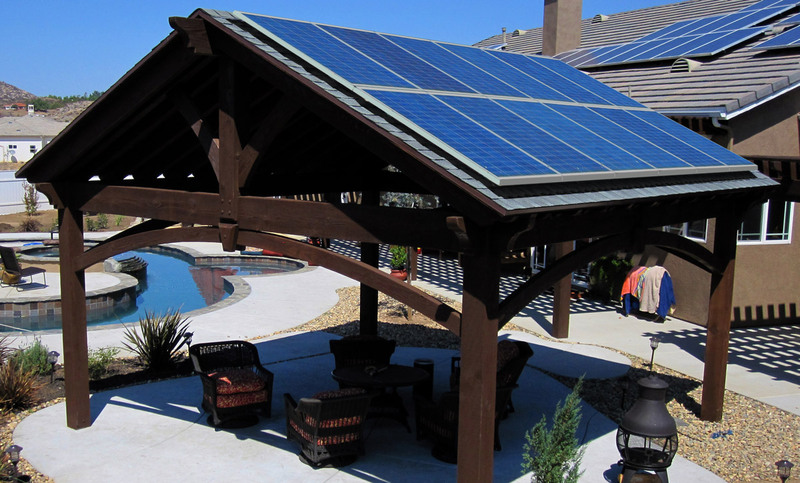 Garden features like pergolas and gazebos also work well as a place to install poolside solar collectors for solar pool heaters, while carports can be paired with a home charging station to power an electric vehicle. Either way, you’ll be adding a first-class luxury feature to your home, while saving money on your utilities. Pretty smart! 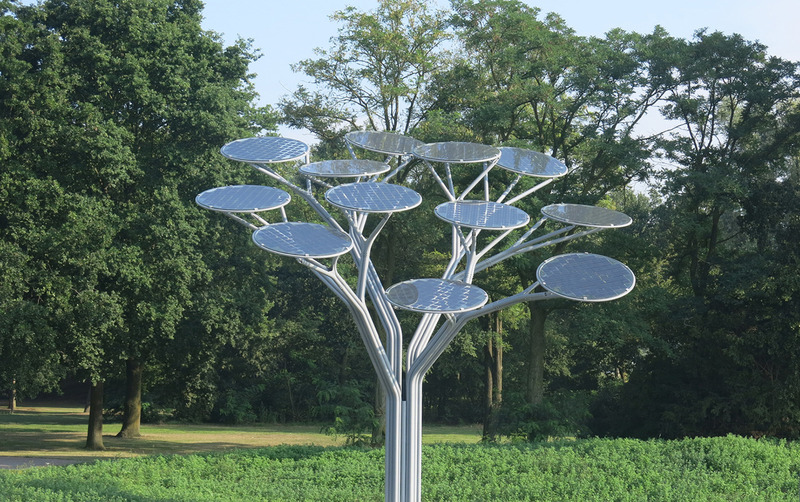 As a unique take on residential solar, these solar trees can be custom-designed by a willing solar provider and architect, or bought pre-fab from companies like Spotlight Solar and Envision Solar. They often include a solar battery or other storage option as well, so you can store away some extra energy for a rainy day. Solar has never looked so good.